Hard disk a data storage device which is non-volatile, it stores data electronically on the magnetic surface that are layered on hard disk platters. It’s different from a floppy disk and that way the word “Hard” has been introduced plus it’s not in a soft form. Hard disk nowadays comes in a variety of new products that we hear in day to day life. Like memory card, SD card, SSD, etc. All of these stores data in a range of 10 to 1000’s of gigabytes. Whereas floppy disk which has been obsolete now only carried a capacity of 1.4 megabytes. The hard disk is a common term which is now associated with many appliances like computers are evident Plus we have video recorders, digital cameras, mobile phones, audio players, digital organizers, etc. ‘Reynold Johnson’ was the father of hard disk who invented it in 1955 for IBM the computer that had a 24-inch platter and at the time it had a character capacity of 5 million. Later in 1956 first hard disk was launched in the commercial market with a capacity of 5 MB. Now after 60 years of development we have TB’s of ability and there are many vendors like Seagate, Toshiba, Samsung and many other big players that make hard disks. 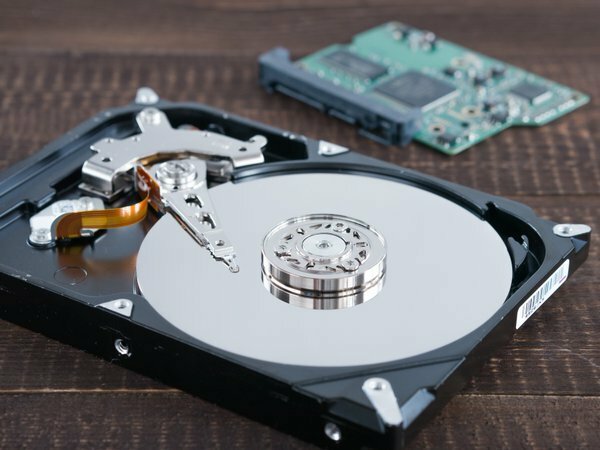 After the above introduction, I wanted to share few important components of a Hard Disk, which may help you understand the functioning of hard disks. The Platters: Platters is an essential element that actually stores the magnetized data. In the past and still the conventional platters were made up of aluminum alloy and later on they were converted to glass and ceramic platters as they are more heat resistant and thinner. The drives normally have two or more platters and bigger the platter, the more capacity will it carry. Spindle Motor: Hard disk have another element that’s quite essential in the functioning is the spindle that spins the platter at a constant RPM. The read-write heads move along and between the above-explained platters on their common arm. This motion is uniform and the revolving spindle is clamped with disk spacers that divide the platter. This spindle motor has been built into the spinning spindle that will rotate the platter at a rate of constant RPM ranging from 3,600 to 7,200 and much more these days. Heads – Read/Write: All the heads move in harmony and their basic function is to read and write. In past the hard drive read and write function was done at one on one basis, it means if the head is writing that it will read later and vice-versa. When in motion the heads lift off automatically due to air pressure otherwise the heads are always in contact with the platter. This gap is tiny that not a single dust particle can enter, but if it does then it could disable the spin. When there is no motion, the heads come to their preset positions and this zone named as a landing zone. Head Actuator: The head actuator is the element where all the heads are attached, this actuator is the primary element that moves the heads around. The actuator arms are made to move in such a way that covers all the platter surface. Most of the hard disks work under same methods, but SSD drives don’t have the spindle and it works slightly different from what we have gone through above. We will cover about SSD’s in another topic.